Hello! 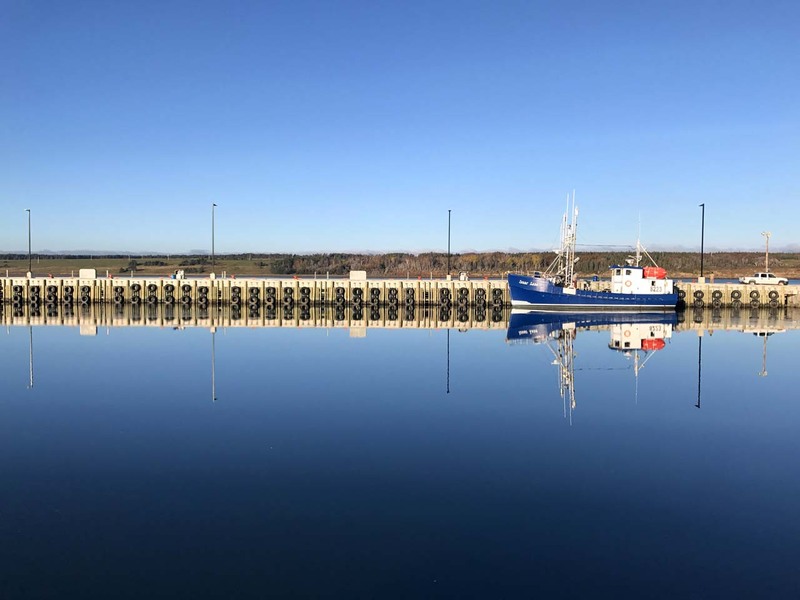 It’s been way too long since we last blogged (or vacationed, for that matter) so we thought we’d share our experiences in the Canadian province of Nova Scotia. 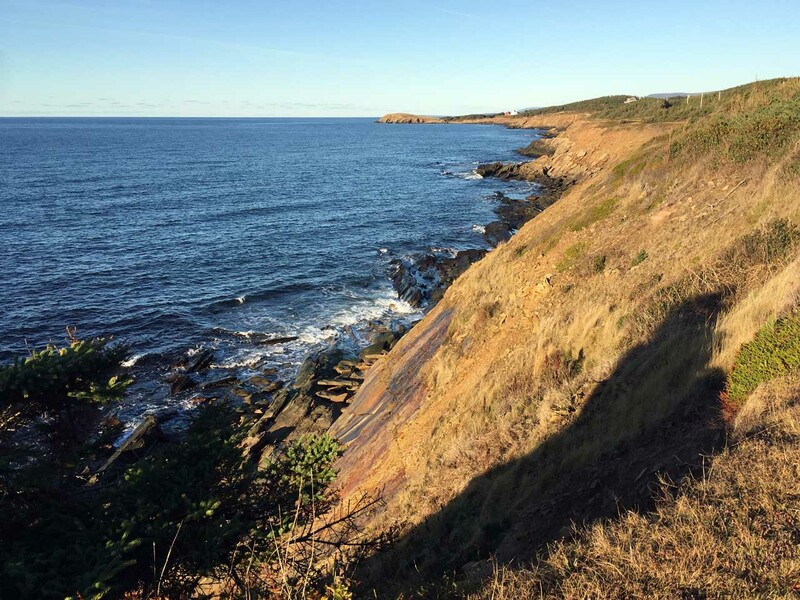 You may wonder, why Nova Scotia? Honestly, I have no idea how we ended up here! The recent end of long work projects (and that November is not really peak season anywhere), resulted in us picking rather randomly. So Nova Scotia it is! Along those lines, the only thing we had planned was accommodation at a beachside VRBO for 8 of the 10 nights of our stay. We COMPLETELY winged the rest! I thought I was visiting Canada. I had no idea I was visiting (New) Scotland. I know, I know. 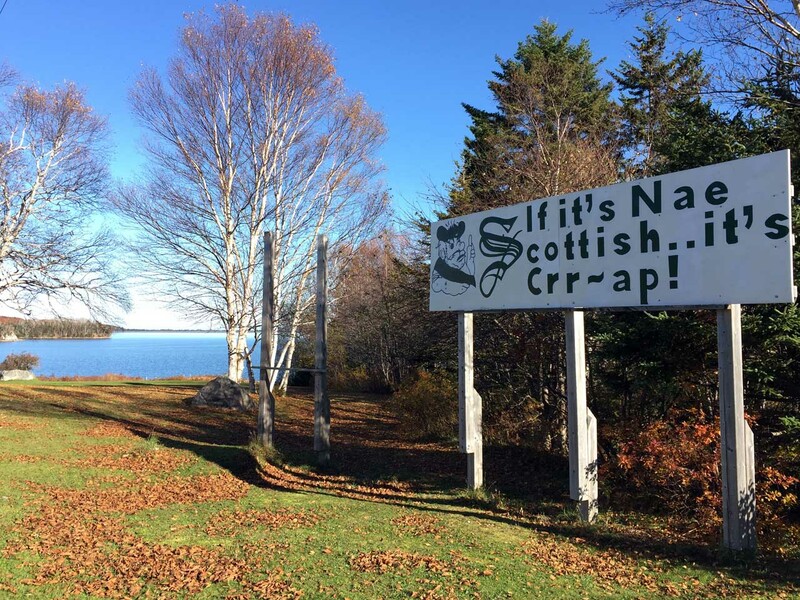 Its name is Nova Scotia (read: New Scotland) – but that had never occurred to me before this trip! In fact, we saw this sign during one of our drives and it cracked us up, so we thought we’d share! We’ll talk more about the Scottish influence in a later post, but I wanted to go ahead and frame the scene early! We stayed in a VRBO near Cape George (northwest of Antigonish on the above map), so that we could have (1) beachfront accommodation (2) a wood-burning fireplace in case the weather was crap and (3) a sunset view over water. You don’t often get that on the east coast, so we wanted to take advantage. Like I said before, we didn’t have much time to plan (or even contemplate) this trip before we got here, so everything was new and unexpected! 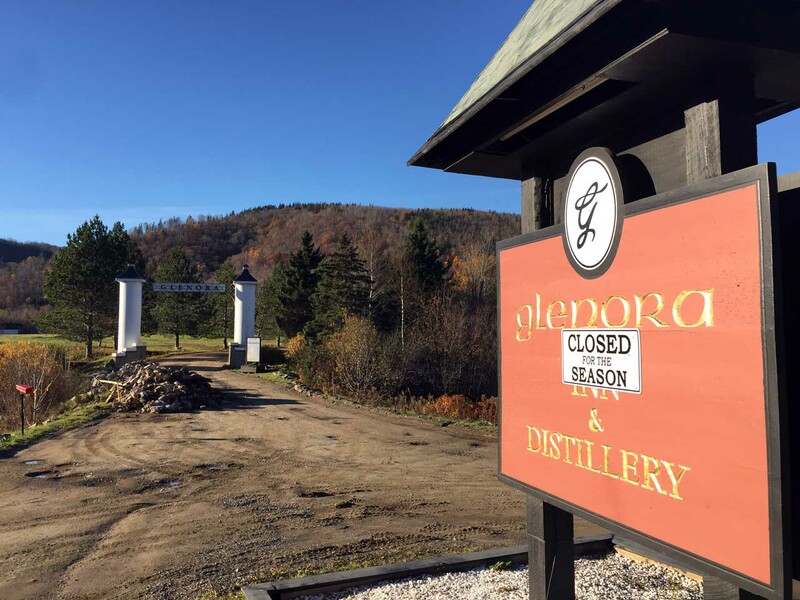 I should also note that November is off season in Nova Scotia, so we were aware that many things would be closed. No worries. We don’t like other tourists anyway! 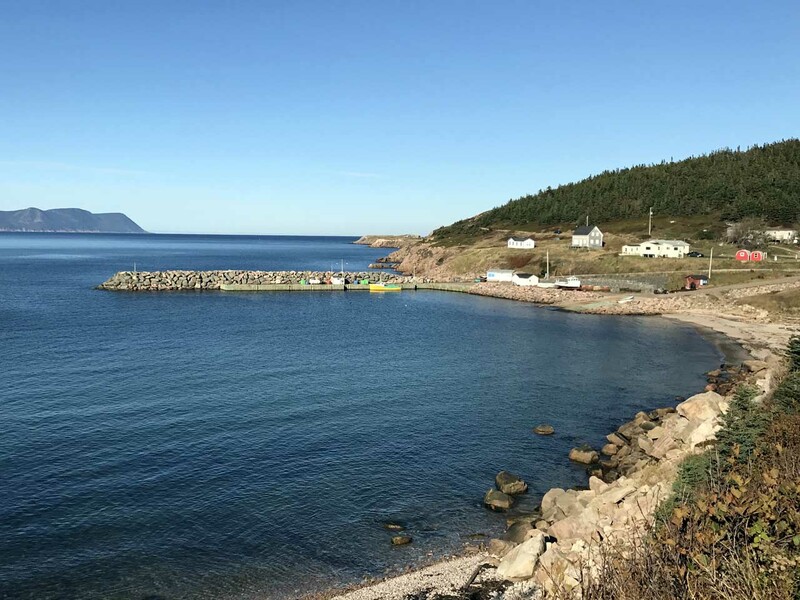 Cape Breton Island is in the northeast part of Nova Scotia, and the part we’d heard the most about. Thus, we had to check it out. We spent 1 night/2 days there. 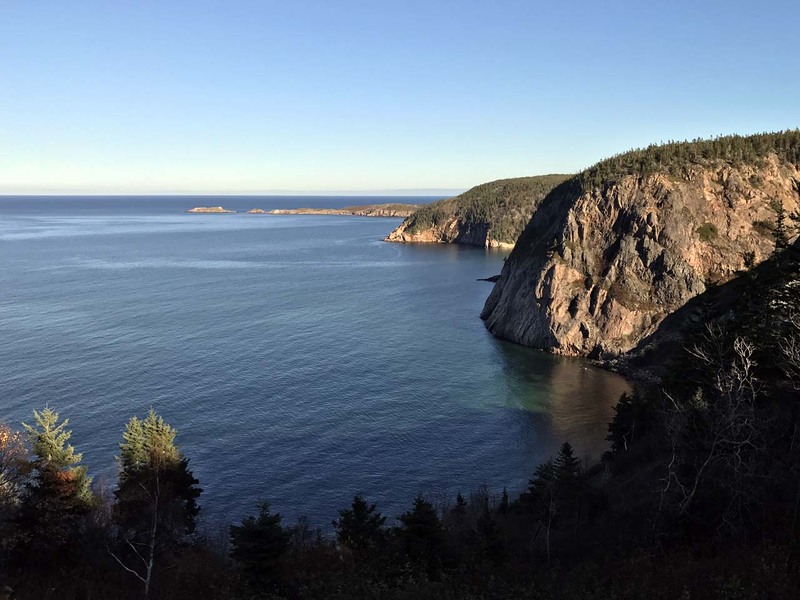 The most popular part of Cape Breton Island is the Cabot Trail – an ~300km (~185mi) scenic drive that loops around part of the island. Our plan was to see as much as we could of Cabot Trail during our 2 days. To get there, though, instead of taking the highway, we chose to take the coastal road called the Ceilidh Trail, and I’m really glad we did. 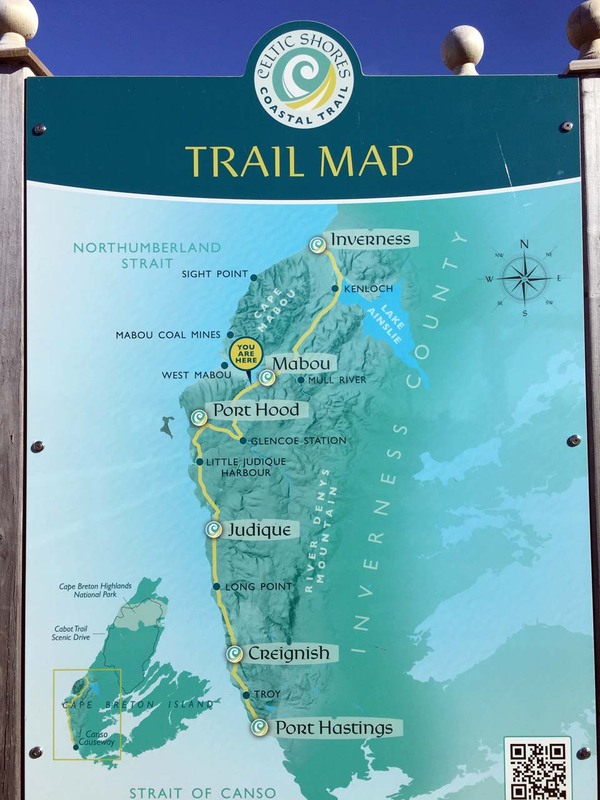 The Ceilidh Trail is a 100-km long scenic coastal drive on the west side of Cape Breton Island that spans several small towns and overlooks the Gulf of St. Lawrence. Ceilidh (pronounced kay-lee) means “gathering” and honestly, I can’t tell if it’s Irish, Scottish, Gaelic, or all three, but nevermind. The Celtic presence in this area was SUPER STRONG. And I must say, I think I’d like these Celts. From what I can tell, their “gatherings” consist of singing, dancing, and generally loving life. What’s not to love? 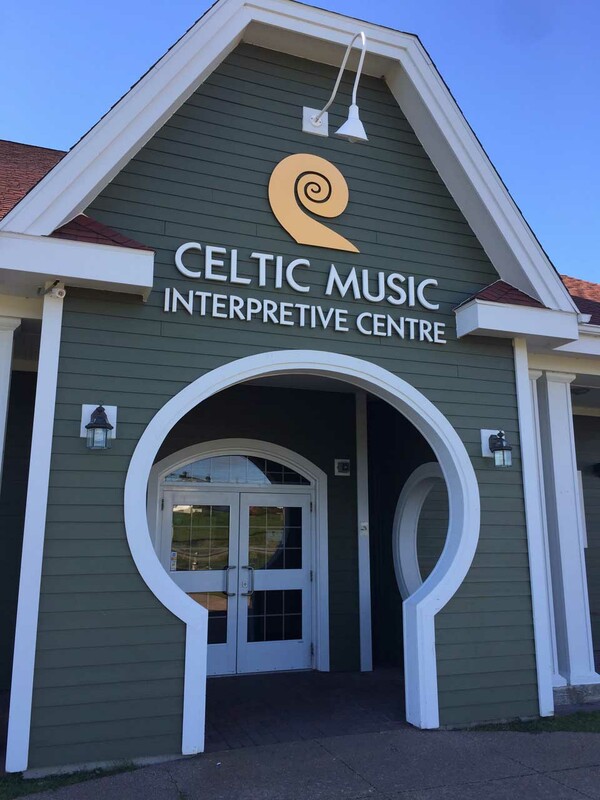 One sign even called this Canada’s “Musical Coast.” Sign me up! 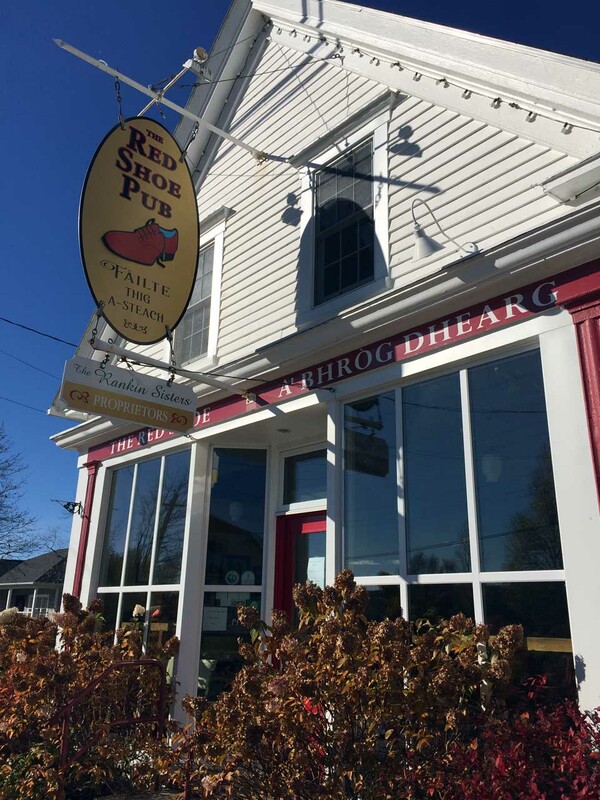 …as was the Red Shoe Pub in Mabou that is famous for its singing and dancing. Boy do I bet those walls could tell some interesting tales! I would SO LOVE to dance a jig there! In addition to music, there was also a hiking/biking trail (Celtic Shores Coastal Trail) that had once housed a railway line. This reminded us a lot of the Otago Rail Trail in New Zealand. Since most things were closed, we spent a bit of time driving the back roads, as we love to do. 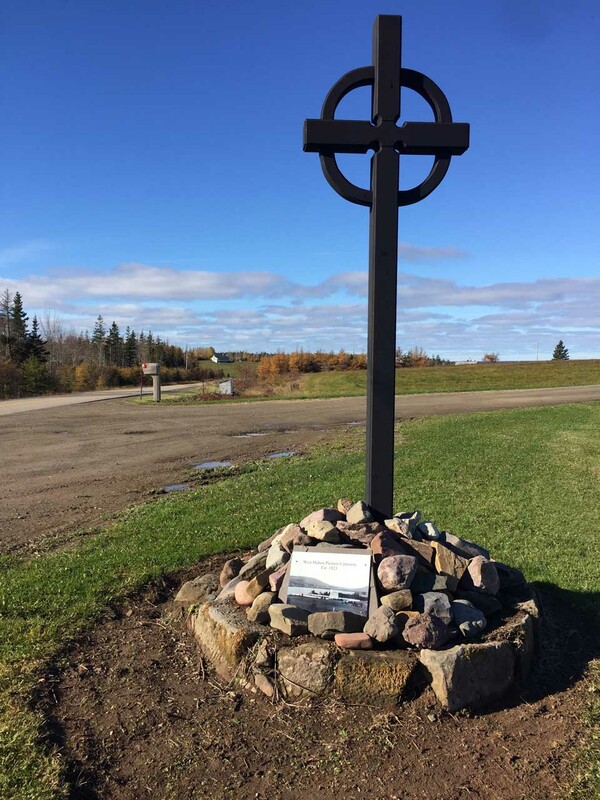 We came across this Celtic marker for a pioneer cemetery. …the funniest story was of the 2 fisherman who were chatting there when we pulled up. Given that we’d barely seen anyone on our drive, our first reaction was just to be shocked to see them there. But imagine our surprise when we realized that one of them was wearing a UNC ball cap! So of course, we had to ask them about the hat. “Do you like UNC?” “We are shocked to see a Tarheel up here!” His response was priceless. He had no idea what hat he was wearing. Some kid his daughter dated gave it to him. Hmmmmph. Well, that was that. But it gave us a good chuckle. Before we moved on, we asked him where he was from, since he had quite a thick accent. He pointed and said he’d lived his life on this hill and his buddy lived 2 hills over. With that accent, we thought he was straight off the boat from Scotland. No lie. Still amused at this interaction, we then found a small cafe open on our way out of town. We talked to the young girls in there while they prepared some poutine for us to go. (We couldn’t just use the bathroom and leave, so why not purchase a Canadian delicacy [wink, wink!]) They were mesmerized by the Kiwi. Given the lack of tourists this time of year, I have no doubt we were providing fodder for the locals to chat about! Ah, the glory of unplanned adventures! 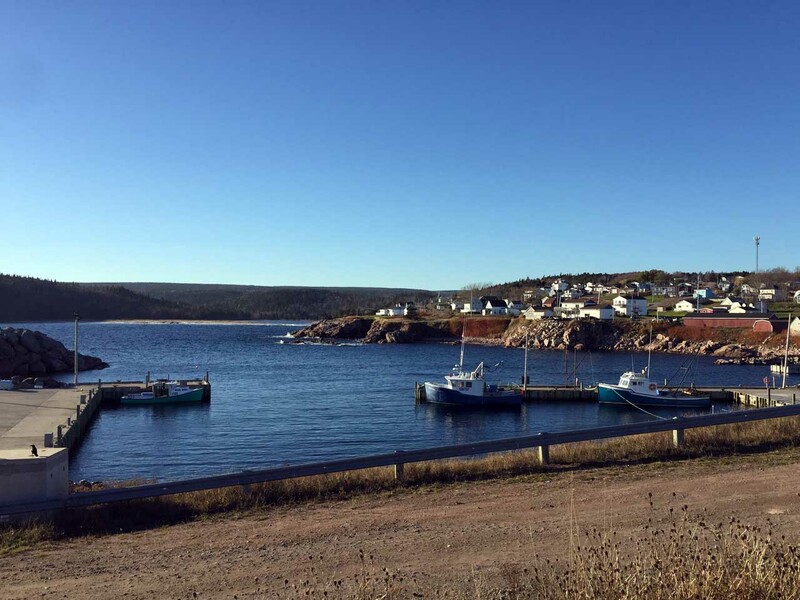 Further along, we came upon Margaree Harbour, the last town of the Ceilidh Trail before hitting the Cabot Trail. As with most other towns, it seemed like a ghost town, with few people about and even fewer stores open. So imagine our delight when we saw this faded “Open” sign on Laurence’s store. We couldn’t miss the opportunity, so we had to go in! 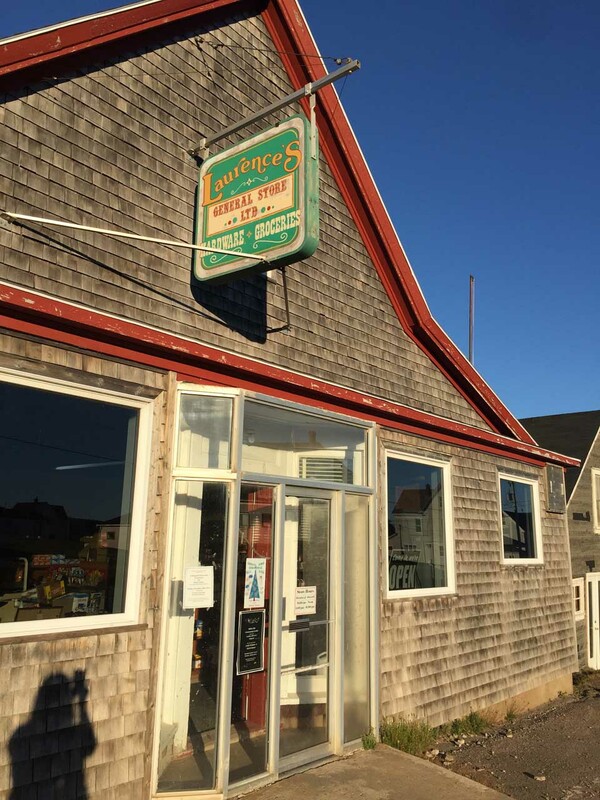 It was a small general store, and empty as far as we could tell. We perused a bit before the storekeeper made his way out from a back office. We bought a postcard and sodas (we had to buy something, since we made him come out!) and began to chat with him. He was clearly used to locals and was intrigued by tourists this time of year, especially Americans. “So, how about that election?” he says (this was before election day). We chatted a bit more about the election and world politics before telling him we had to go. I have no doubt he will be telling locals about us crazy Americans who were fleeing the election madness…The idea of it amuses me greatly. Clearly we made his day. And he ours. Around the corner from his shop, we passed one of the many (many!) 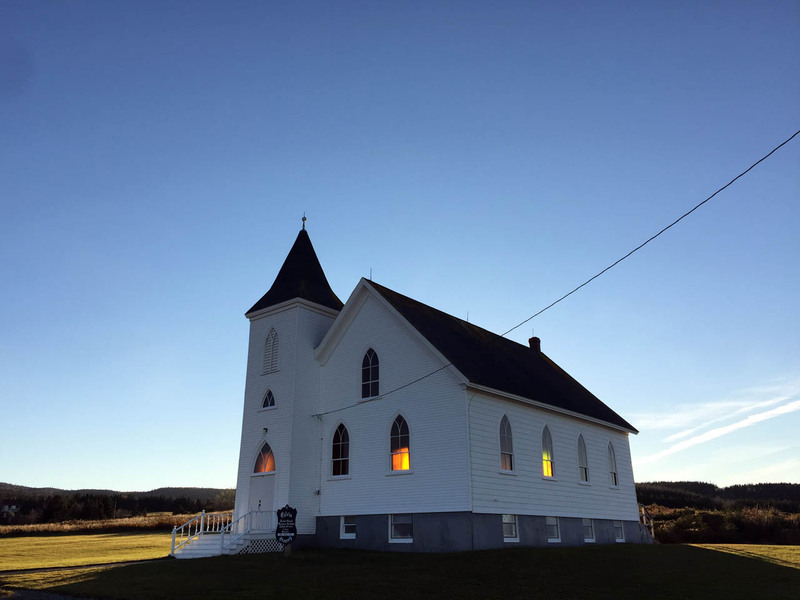 white clapboard churches in Nova Scotia. This one was unique in that it looked like it was on fire due to the backlighting from the sun. Cool. My oh my. Bottom line from this tour of the Ceilidh Trail is that this is what you get when you don’t plan! 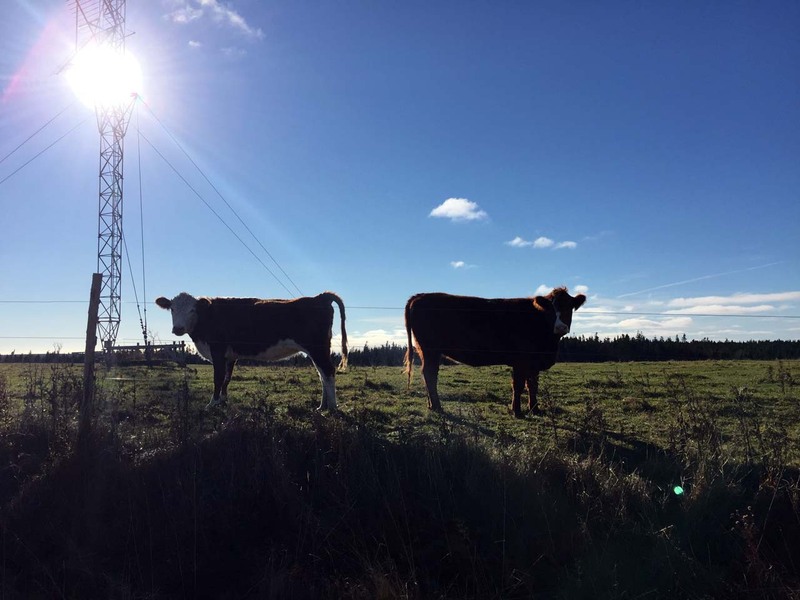 Disrupting fishermen, discussing world travels with impressionable shop girls, lunching with cows, and debating the state of world politics with an elderly Canadian gentleman. And you know what? I wouldn’t change one single thing. Moments of authenticity is what I’ve called them before — you know, those little moments of magic that happen when you’re traveling. When you get to connect rather than just see, and remind yourself that we’re all human, just sown and grown differently across the globe. I love it. But enough of that, now it’s on to the Cabot Trail! 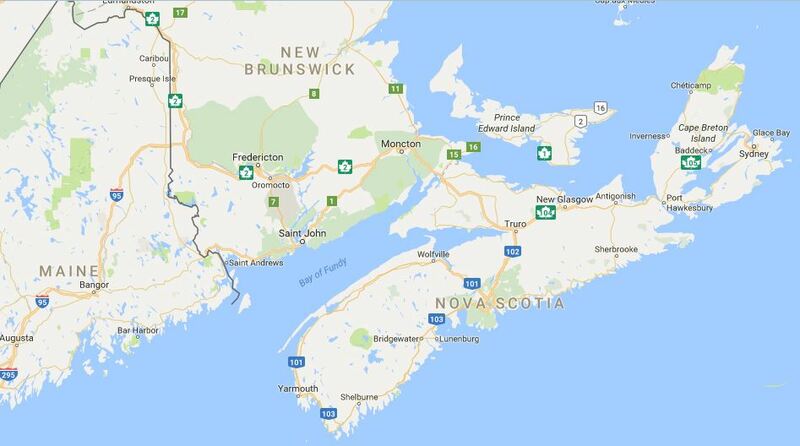 Like I mentioned, the Cabot Trail is famous across Canada (or maybe even the world, per their claim below). 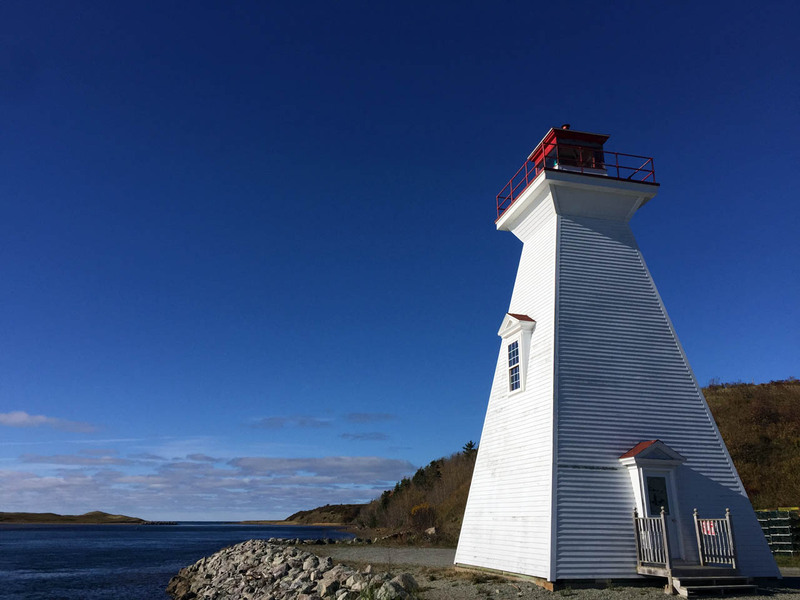 Everyone we’ve spoken to touts it as the “must see” attraction in Nova Scotia, so of course, we had to see it! This was just enough to whet our whistle, before we bunked in the French/Acadian town of Cheticamp for the night. 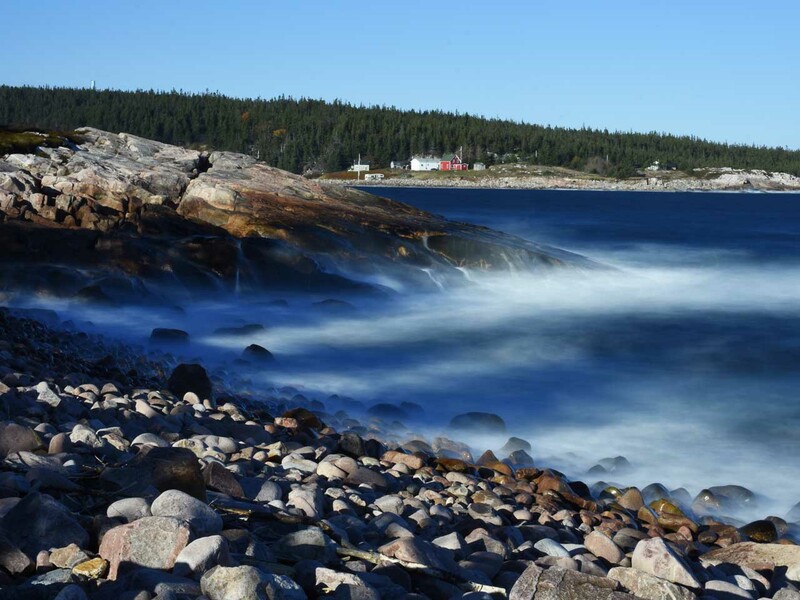 Nova Scotia seems to have pockets of different nationalities – fascinating! After our B&B hostess gave us oodles of helpful information (we needed it! ), we went to bed early so we could get an early start on the Trail. This boat was one of the first things we saw when we woke up, on a crisp and still -2degC morning, with frost on the ground. Brrrr. Winter is coming. 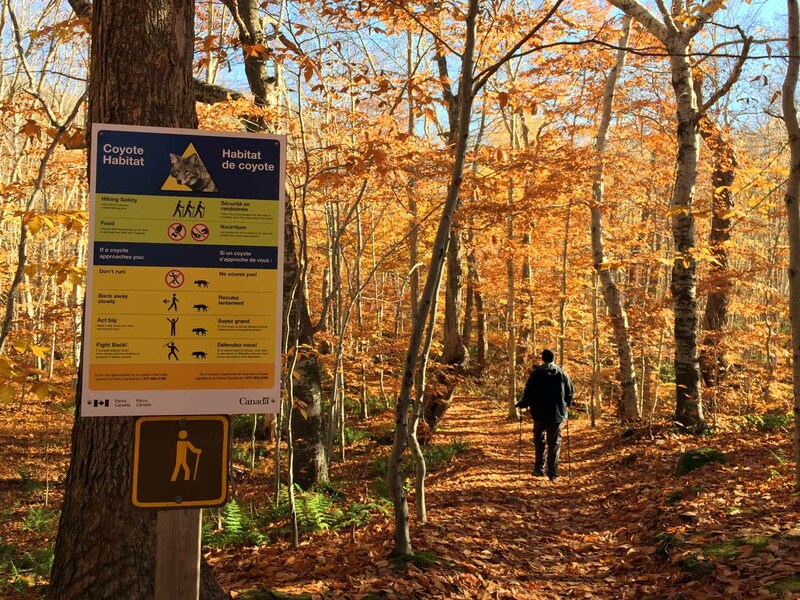 The first thing I’ll say is – we were the only people on the trail (aside from the 2 Parks Canada groundskeepers at the beginning). Woah! We had to walk through 2 completely empty (large) parking lots to get to the start of the trail. 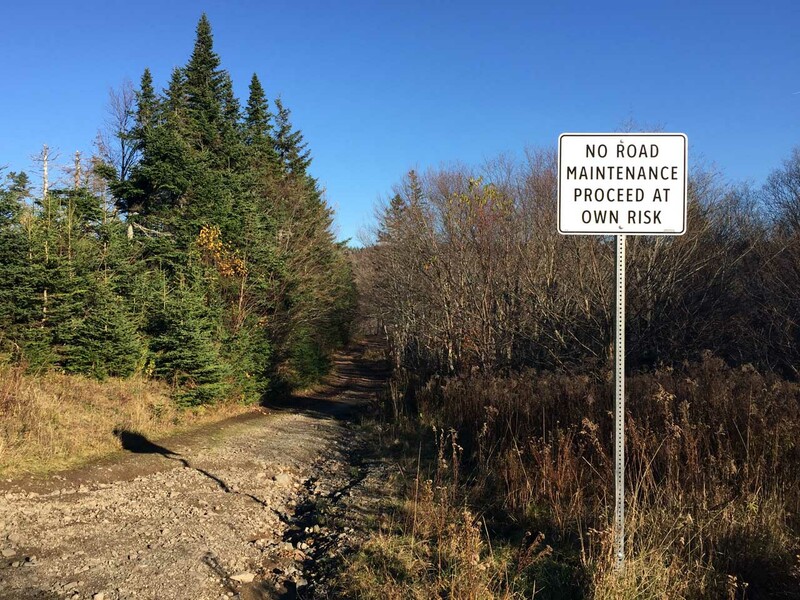 In peak season, these lots (and trail) are packed with people. Yet we had it all to ourselves. Ah, the glory of off-season traveling! 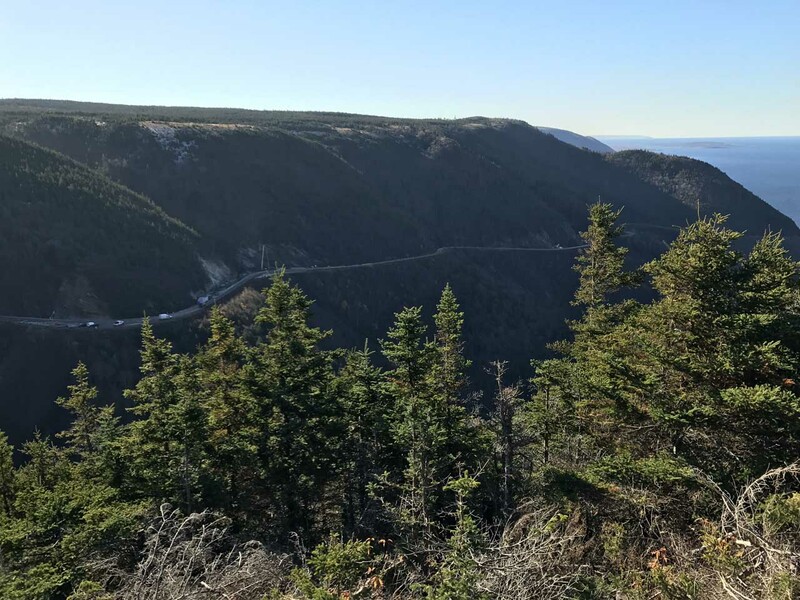 From which we saw this view of the Cabot Trail, a feat of engineering, no doubt! I have been incredibly fortunate in my life to see such grandeur as Glacier National Park in Montana, Mount Aspiring in New Zealand, the Swiss Alps, among others. (Aaaack, my heart is racing even as I type this!) If I hadn’t been looking up – we had been watching our feet a lot, since there was some ice on the ground – I would have run right into him. Thankfully, I didn’t. But he did scare the bejeezus out of me. My fight or flight system went into hyperdrive (flight, not fight!) but my mind simultaneously told me not to spook him, so I backed up gingerly, like you see them do in cartoons. I croaked “bull moose” to Jeff, as I tippy-toed backwards. Jeff was immediately intrigued and had to go check it out. My reaction was 100% opposite. I had just looked up at a 1000-1200lb beast that stood 7-8 feet tall with huge paddles/antlers, soft eyes, and dopey ears. It never once occurred to me to try to get a picture. My only thought was – we are on this trail alone, with a beast that could kill us, and likely bad cell reception. How quickly one’s perspective changes, eh??? In hindsight, the moose couldn’t have cared less about us. That said, he did wander parallel to the path for a bit, so we had to stalk him to keep an eye on where he was until we could get around him and out of the park. What I couldn’t believe was how graceful and quiet he was. Given his size, I would have thought he’d make noise (if by nothing other than his antlers hitting tree limbs) but he didn’t. We had to really pay attention to keep him in sight. Nature is amazing. Here is Jeff’s pic of Mr. Moose. I’ll still see him in my dreams. I think I am still recovering my adrenaline stores. 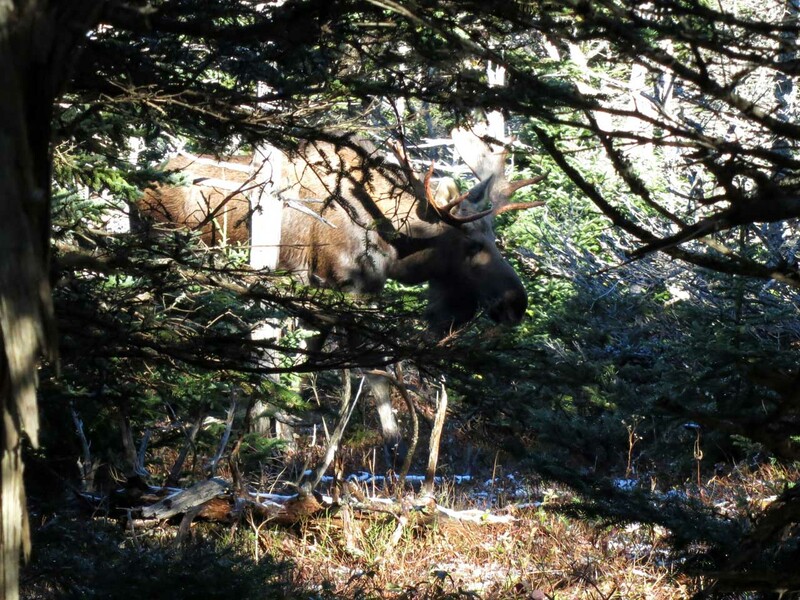 Honestly, nothing nearly as interesting happened the rest of Cabot Trail, for what could top my first bull moose encounter!?!?? A Lone Shieling – a small Scottish crofters shed. 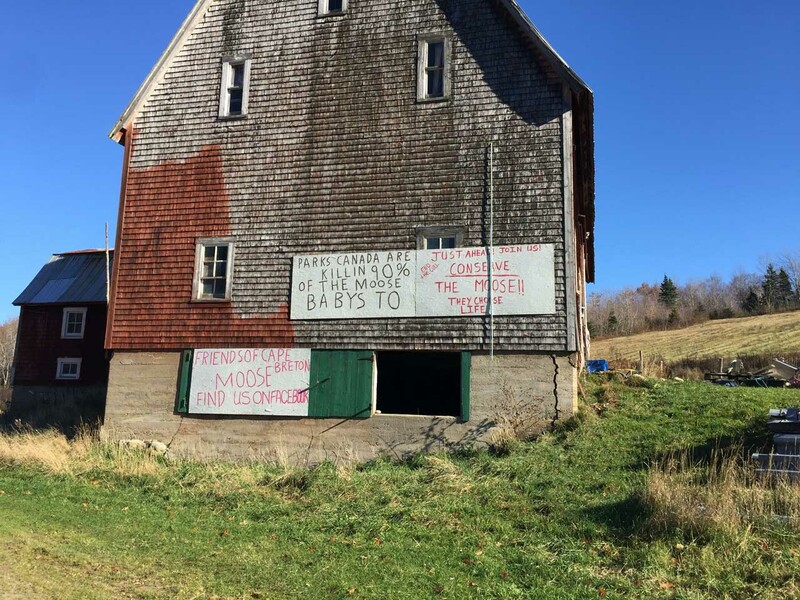 There was nothing notable in that, except that it was in a completely picturesque setting (that could almost make you believe it was still fall in Nova Scotia)…and that there were signs for coyotes. No thanks, one beast is enough for me today. Yowzers. 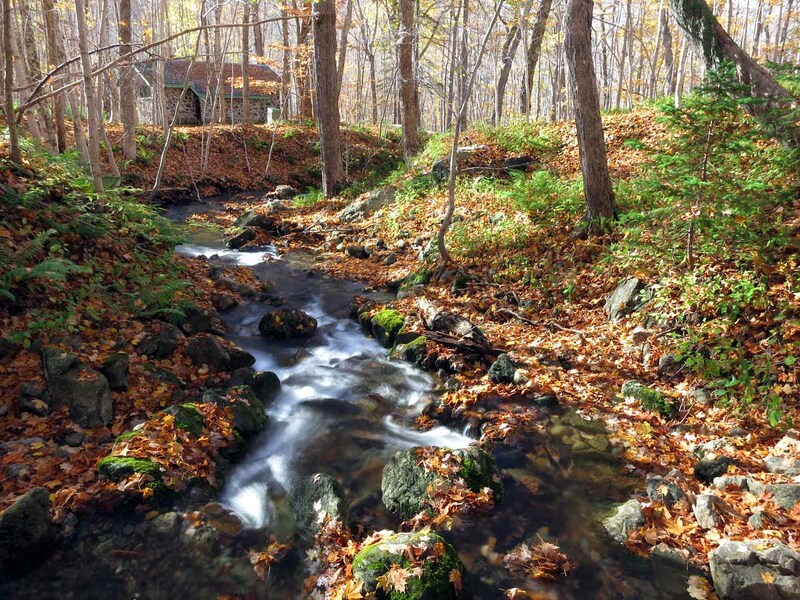 This beautiful stream was also in this area. Our next stop was the Beulach Ban Falls, but apparently waterfalls were not meant to be on this trip. The closed sign below gave me flashbacks to our New Mexico trip during the government shutdown (shudder). In way of explanation, the moose population in the park has exploded since an insect invasion took out the softwood trees (mostly spruce), allowing hardwoods to grow in their place (which moose love). 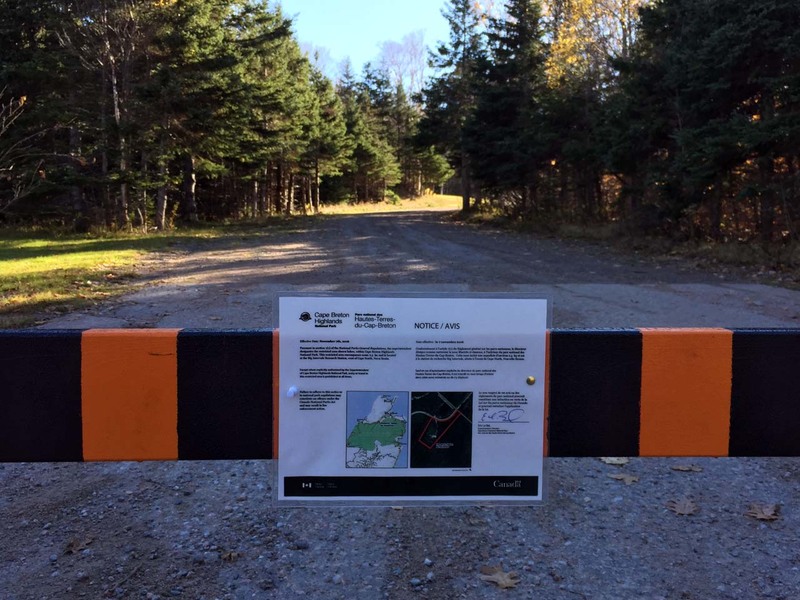 They are considering culling the moose population to get their native vegetation back. Jeff had a great time photographing the waves as they crashed onto shore in New Haven. (I loved the small red cottage in the background.) This area reminded us very much of Maine. That was about all we had time for before hightailing it back to our VRBO. 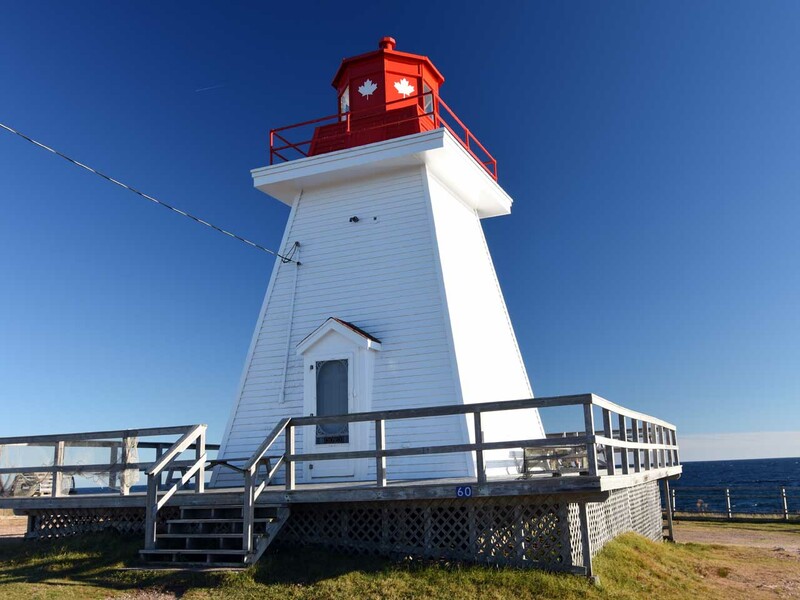 With sunset at 4:30, we tried to minimize how much driving we had to do in the dark, so we missed the Alexander Graham Bell museum in Baddeck, along with some other Cabot Trail attractions. Maybe another time. Overall, we had a great time exploring the Ceilidh and Cabot Trails. 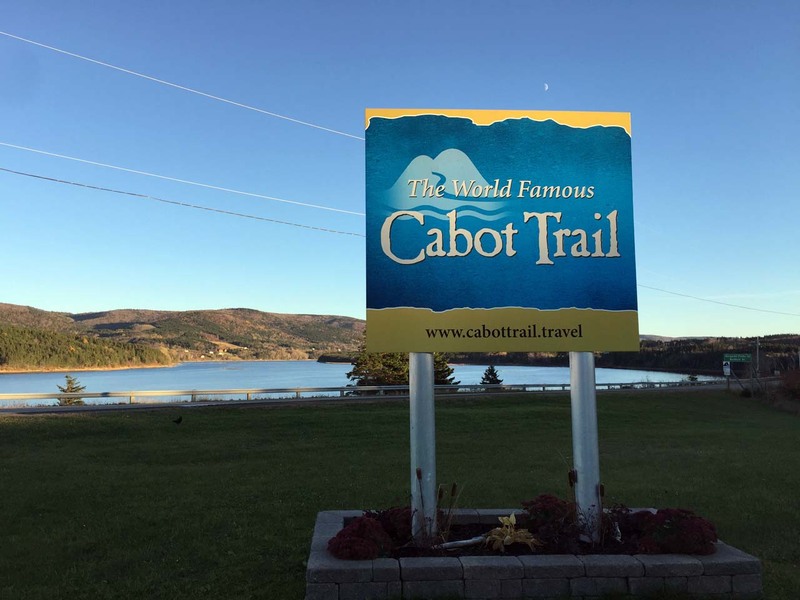 I think it would be fascinating to experience the musical culture of the Ceilidh Trail during peak season and to see the Cabot Trail at its most beautiful in the fall colors. Mmmm. 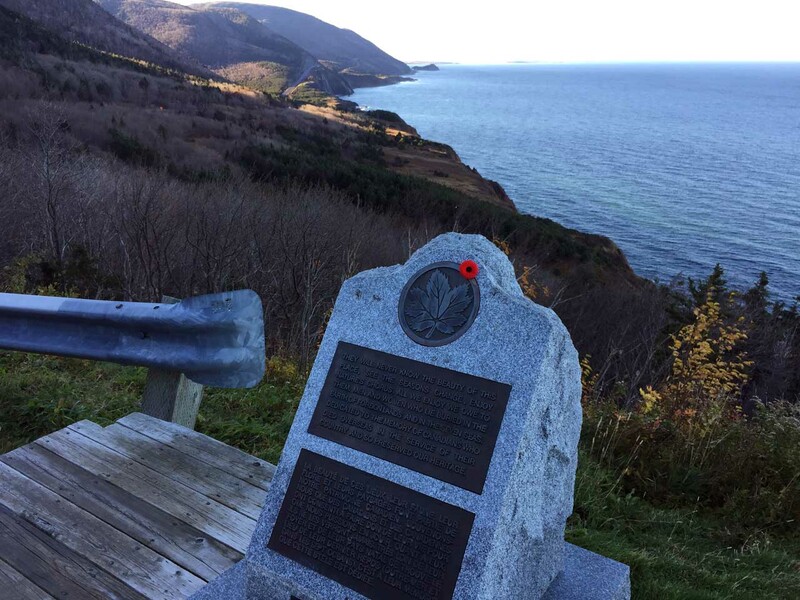 There was also a whole separate side of Cape Breton Island that we didn’t make it to – again, maybe next time. 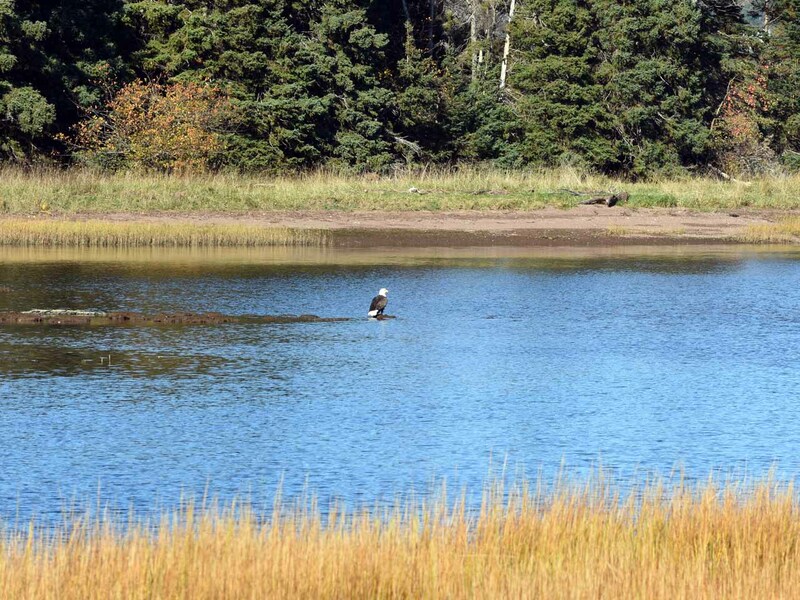 But until then, we hope you’ve enjoyed this introduction to what we saw of Cape Breton!!! 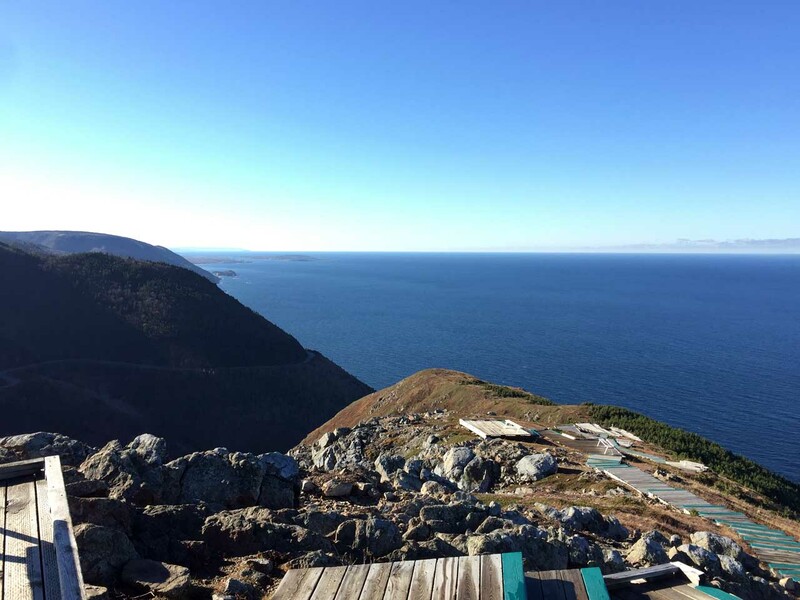 The West Coast of NZ – Finally! Murano, Burano, Torcello, and more!